We consider the area of Southwest Alaska to include all of the area West of a line beginning at the Eastern tip of Kodiak Island and continuing North to the Yukon River at a point near McGrath Alaska and continuing Westerly along the Southern boundary line for Interior Alaska to the point where the North Northwest Alaska boundary intersect and continuing Westerly along the Southern North Northwest Alaska boundary line to the international boundary line in the Bearing Sea and including the Aleutian Islands and Kodiak Island and any other Alaskan Islands to the West of the East line. Southwest Alaska includes all the towns and villages listed on the left and includes the Aleutian Islands. Click a name for more information. A sparsely inhabited region stretching some 500 miles inland from the Bering Sea. Most of the population lives along the coast. Kodiak Island is also located in Southwest. The massive Yukon–Kuskokwim Delta, one of the largest river deltas in the world, is located here. More than 300 islands small volcanic make up this chain, which stretches over 1,200(1,900 km) into the Pacific Ocean. The International Date Line was drawn west of 180° to keep the whole state, and thus the entire North American continent, within the same legal day. With its myriad islands, Alaska has nearly 34,000(54,720 km) of tidal shoreline. The Aleutian Islands chain extends west from the southern tip of the Alaska Peninsula. 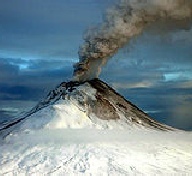 Many active volcanoes are found in the Aleutians and in coastal regions. 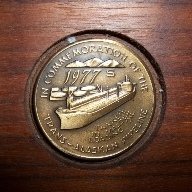 Unimak Island, for example, is home to Mount Shishaldin, which is an occasionally smoldering volcano that rises to 10,000(3,000 m) above the North Pacific. It is the most perfect volcanic cone on Earth, even more symmetrical than Japan's Mount Fuji. The chain of volcanoes extends to Mount Spurr, west of Anchorage on the mainland. Geologists have identified Alaska as part of Wrangellia, a large region consisting of multiple states and Canadian provinces in the Pacific Northwest which is actively undergoing continent building. Alaska has more than three million lakes, Marshlands and wetland permafrost cover 188,320 miles (487,747 km2) (mostly in northern, western and southwest flatlands). Glacier ice covers some 16,000 miles (41,440 km2) of land and 1,200 miles (3,110 km2) of tidal zone. The Bering Glacier complex near the southeastern border with Yukon covers 2,250 miles (5,827 km2) alone. With over 100,000 of them, Alaska has half of the world's glaciers. South West Alaska includes all the cities, towns and villages on the left. Click a name to see more information.